It’s crunch time. As the threat of summer approaches, all efforts are being channeled towards getting the elusive summer internship. It’s one of the few ways we can gain real world experience before graduation, and critical in order to secure a permanent job after we leave the gates of Tech. The portfolio is an essential part of this process, which makes sense. How else do we show prospective employers our work? But there is just one tiny issue with this. I have no idea how to actually make a portfolio! My creative endeavors up until this point have been in the fine arts. In fine arts, the portfolio is pretty straight forward. You write a 1 page artists statement, you write a slide page, and you put your art into portfolio sleeves. If you have sculpture, you take high quality photos of the work from multiple angles. But design? Oh no, brother. It’s not nearly this simple. There are layouts, and grids, and color schemes, and visual hierarchy, and photos, and sketches, and grids, and icons, and did I mention girds? I began asking my peers how to make a portfolio and kept getting the same response. “Just make a grid,” they all said. Just make a grid? Ok, what does that mean? How do I make a grid? What size should it be? What are the proportions? What is a good grid? What is a bad grid? All these questions would fly through my mind, and clarification beyond, “just make a grid” was rarely provided. So, I took matters into my own hands. This past week, I attended a portfolio review through our local IDSA chapter. I put my work into what I knew at the time, bound it, and went to the event. Probably one of the first legitimate networking events I had been too since starting my program, I was in my element. The small talk, the exchange of business cards, the industry specific jargon, the anecdotes and lame jokes. It was networking at its finest. And although I was a little rusty, I was like a tiger who had been locked in a cocktail party-less cage for 7 months and finally released back into the wild. As the mingling subsided, I suddenly became nervous. We had reached the part of the night where the actual reviews began. I expected the reviewers to tear my poor portfolio to shreds—to say the work was hideous, the layout belonged in the trash, and that the gird was just the most abominable thing they had ever seen in their entire lives. It is better to have 3-4 highly detailed projects in your portfolio than 20 overviews. Employer’s want to see how you think. They don’t want to see just the end product. Put in sketches, models, prototypes, and the final product. Also, they want to see the research behind the project, so putting a page on the backstory and research involved in the design is a good thing. Have both a print and digital portfolio. Maybe this seems obvious, but out of the 20 or so students at the event, I was one of the only students with a print portfolio. As I got to the last reviewer, he thanked me, stating that all night he had been hunched over computer screens looking at tiny images. Designers like using their hands, and that goes for touching portfolios too. Show what makes you you! My portfolio was about half design, and half fine art. I was nervous that I would get critiqued for that, but instead found the opposite. Everyone loved that fact that I had fine art work and even told me to elaborate. Many designers are not fine artists, so this is a skill that I need to accentuate. They told me elaborate on my work, include studies, and delve deeper into the research that informed my art. So, what then, can we learn from portfolios. Well, at the end of the day, I learned that quality always out shines quantity. I learned that every portfolio will be different and that there is a no one-size-fits-all style. Do your hard work justice, and let it shine. And lastly, I learned that when the work is good, no one is going to say jack squat about your grid. How funny is it that every day we interact with a myriad of objects and environments but know little about the people that created them—designs inextricably linked with our identity that you couldn’t begin to describe the history of. This past week, I was confronted with some these identities through a series of discreetly linked events. On Monday, a professor told our class about the passing of Japanese designer Kenji Ekuan. Most famously known for designing the Kikkoman soy sauce bottle, he was one of Japan’s most revered designers and responsible for countless influential designs. He was a giant, and I had no idea who he was. After class, I did some digging and found that he was on the design team of the Shinkansen high-speed train in Japan. I had to do a double take, because just 20 minutes previously, I had been editing a piece about the rail system for my work through The Biomimicry Institute’s Ask Nature project. Previous to that, I had been reading an article about the train in Zygote Quarterly. I sat back, for a moment, basking in the delight of such a serendipitous twist. On Tuesday, I was confronted with another one my idols. I’ve been watching John Stewart’s The Daily Show since adolescence. Though through a T.V. screen, he was undoubtedly a part of my life, helping foster my interests in politics and global development. So imagine my shock and heartbreak when I learned Tuesday night that he would be ending the show sometime in 2015. Granted, he wasn’t a designer, but he brought on designers, writers, artists, and activists. He gave them a national platform that they otherwise wouldn’t get. Additionally, his mentorship of Stephen Colbert was huge for me. It was on The Colbert report that I first saw a 3D printer, and watched a pivotal interview with Senior MOMA Curator Paola Antonelli, arguably introducing me to the field of industrial design and changing the course of my professional life. Finally, this week introduced me to designer Henry Dryfus. He was the man behind the Honeywell thermostat, the modern Bell Telephone, and mid-century tractor designs. My History of Industrial Design professor was lucky enough to be contacted by a Dryfus historian who then came into our class to speak. I listened as he spoke about Dryfus’ accomplishments and how they had impacted my life in small ways. Like how Honeywell, a Minneapolis company, was in my home of Minnesota and helped establish Minnesota as a major metropolis. Or how he designed tractors which likely had an impact on the way my grandfather did business having worked as a tractor salesmen in the Midwest for over 30 years. I think it comes with out saying that we have to know where we come from. Not only as people, but also as designers. We need to learn from the work of the designers who came before us—their failures, their successes and their temperaments. What made them great? How did they respond to failure? Who were the people and what were the events in their lives that made them great. Knowing these insights makes us better designers, and more integrated into the larger community we are trying so hard to be part of. When I told my family I wanted to become an industrial designer, I had a reaction that I assume was similar to many aspiring designers. My parents starred at me with a look of love and confusion, and asked, “honey, what is industrial design?” This was followed by a, “but, can you get a job as a designer?” and “why don’t you just become an engineer?” I know they meant well, and that these questions came from a place of love and concern, but the frustration was still there. “Oh! I get it, now,” was the usual response. Of course, I have come to learn that industrial design is not easily defined. Depending on whom you ask, you can get wildly varying answers. But for the sake of clarity, I have become OK with letting people think that ID can be defined as making iPhones and modular furniture. So imagine my surprise when one day my mom says, “Allie, Ellen is doing an industrial design show! Are you all watching it? I get what you’re doing, now!” (Ellen, being America’s sweetheart Ellen DeGeneres, and “you all” being my classmates). Was Ellen the missing link? While I knew that a reality show was not the ultimate indication of success as a furniture designer, nor was it a holistic view of industrial design, it did bring up an interesting thought. Was design becoming popular enough where TV executives considered it legitimate programming? And what did it mean that a mainstream celebrity was now a barometer for critiquing a discipline once reserved for high-end Manhattan firms, and gallery directors? In one fell swoop, Ellen had made a convoluted industry digestible to a wide audience of hobbyists and housewives. As I watched the show’s judges critique the contestants’ pieces in the opening episode, I let these questions linger. All esteemed panelists in their own right, their critiques were insightful and informed, and they used language similar to my own peers and professors. It didn’t feel overly contrived nor dumbed down, which I appreciated. So, kudos to you Ellen! While I don’t see a reality show in UX happening anytime soon, I do appreciate the step towards bringing the world of design to the masses. Now, all we need to do is to get Beyoncé in on ID! No, gentlemen, I am not talking about grammar. I am talking about the necessary evil and paradoxically beautiful event necessary for creating life. But before you get your undies in a bunch, and run from this page as fast as you can grunt, “Super Bowl Sunday,” let me give you a little back story. This week, I was on Facebook when one of my favorite sites for girls empowerment, A Might Girl, featured a story about Arunachalam Muruganantham. A lower-middle class Indian man, Muruganantham was shocked one day to find that his wife was continually choosing between purchasing food for their family and purchasing sanitary pads. Rather than purchase sanitary devices, his wife and many other women globally resort to using rags, leaves, grass, hay, and even mud to prevent embarrassment. In many parts of the world, access to basic hygiene is a luxury, and specifically with regards to female health. These alternative methods lead to a host of UTIs and vaginal infections, all which are easily preventable. To add another layer of complexity, the lack in access to hygiene devices causes girls to routinely miss school, and makes it difficult for women to hold steady jobs. Muruganantham, like many men, was shocked by this realization. He began tinkering with a host of low cost designs and prototypes, and at one point began wearing his inventions himself (with the aid of goats blood!) because finding women to were willing to test them was so difficult. Currently, Muruganantham’s products are manufactured in over 1,300 villages and 23 Indian states, as well as employing as many as 10 women in each village. In 2014, Time Magazine named him one of The 100 Most Influential People. I took a step back, and thought about his work through the lens of the industrial designer. User experience is an increasingly important aspect of design. If we don’t understand how our client thinks, acts and what they experience, there will always be a disconnect no matter how strong the product is. Companies like IDEO have near-perfected this model, and countless others have provided supporting material. But what do we do when the user wont engage with the development process? In the case of Muruganantham, there was a very real and critical need. He had to bring “User Experience” to a whole new level, literally putting himself in the position of the client in order to bring a viable product to market. I was also enamored by the idea of a man with no formal education or exposure to design methods using a principle that is still being explored in the design field to a whole new height. 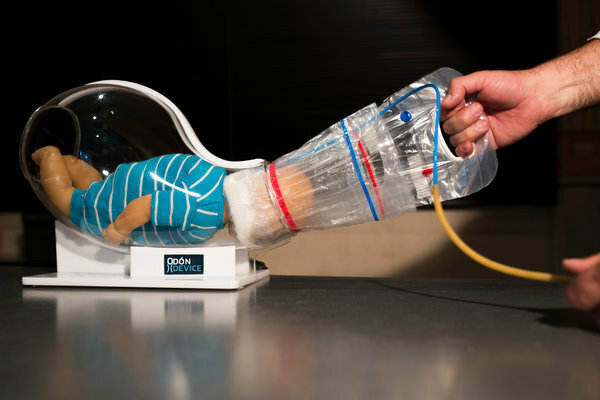 It reminded me of a similar story published in 2013 in which in Jorge Odón, an Argentinian car mechanic, invented a life saving device for emergency births. While part of me reads these stories and thinks, “Why am I in design school again?” the other part of me is inspired by these inventors and further affirms my belief that to be a good designer you need to have a strong understanding of the world you want to design. Being able to wade throu gh the endless sea of design methodologies and diagrams will only get you so far. You need to actually understand the problem you are addressing. This should be common sense, right, but I seem to be finding this isn’t always the case. With this in mind, I leave you with a quote I heard from Dan Formose of Smart Design, New York in the documentary Objectified. He stated, “What we really need to do to design is look at the extremes. The weakest, or the person with arthritis, or the athlete, or the fastest, or the strongest person. Because if we undersand what the extremes are, the middle will take care of itself.” In the case of Muruganantham and Odón, they looked at the extreme. They saw a problem, learned about the user, and worked tirelessly to solve it. The rest, as Formose, stated, took care of itself.